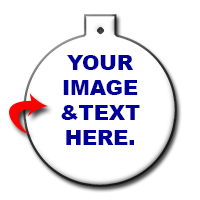 Ball Ornament, Gloss White Sublimation Aluminum 2 Sided Christmas Ornament, 3" x 3.37" x .030" thick. Personalize with photos or text to make an enduring keepsake. Please use a clear photo for your Ornament! What you see in the proof is what your item will look like. We do not edit any photo.